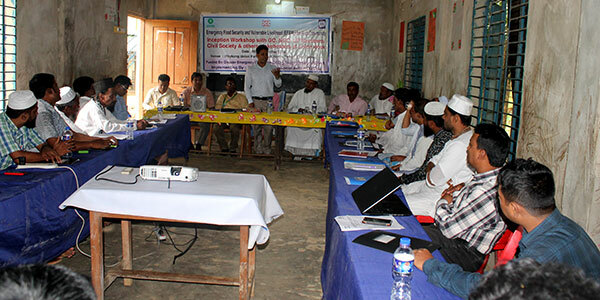 YPSA organized an Inception Workshop of ‘Sustainable Livelihood Initiatives for the Host-Community People Highly Affected by Rohingya Influx in Teknaf, Cox’s Bazar’ at Whykong Union Parishad Hall Room, Teknaf, Cox’s Bazar on 5th September, 2018. YPSA is implementing the project with support from Oxfam in Ward No. 1, 3 & 5 of Whykong Union of TeknafUpazila, Cox’s Bazar. Participants from all walks of life in the union participated in the program. Principle MoulanaNur Ahmed Anwari, Chairman of Whykong presided over the program. Md. RobiulHasan, UNO of Teknaf was present as the Chief Guest while Mr. PalashChowdhury, Director (Finance), YPSA attended the program as Special Guest.Md. 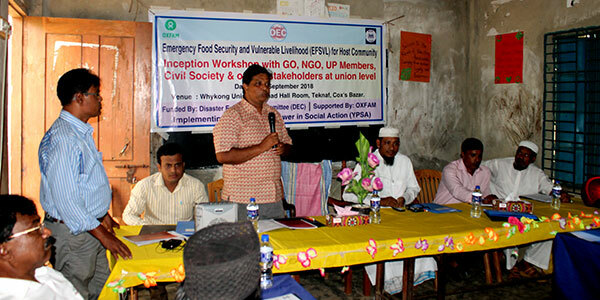 Anwar Hossen, Team Leader, Emergency Food Security and Vulnerable Livelihood (EFSVL) represented Oxfam in the program. Members of the UP, members of civil society, community leaders and beneficiaries participated in the program. The program started with recitation from the Holy Quran. Mr. Palash Chowdhury delivered inaugural speech while Mr. JishuBarua presented a brief presentation on YPSA activities in the program. The Project Manager of the project Md. Ruhullah Khan Kamal made a brief presentation on the Project activities. In the open discussion, participants enthusiastically participated and shared their opinions about the project. Md. 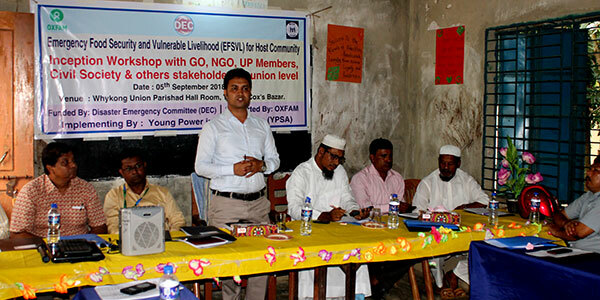 Robiul Hasan, UNO of Teknaf thanked Oxfam and YPSA for their initiatives in order for sustainable improvement of the host-community people affected by Rohingya influx. He also asked both agencies to make more efforts to bring more people under project in the future, if possible. Principle Moulana Nur Ahmed Anwari, Chairman of Whykong union thanked the development agencies for choosing his union to implement such a livelihood project. He requested agencies to expand and extend the project activities so that everybody affected by the recent influx is brought under the project service coverage. He gave his commitment to extend his full cooperation to the staff of the project in the project implementation. With thanks to all, he announced conclusion of the inception workshop.